... and accidentally flirt with someone. The search giant has released a new software update for Google Glass, and with it will come the MyGlass app for iOS. Google says that the iOS app will have all the features that's already available for Android, including integration with Glassware apps like Google Search, Gmail and Google Plus, plus the ability to mirror what you're seeing through Glass on your iDevice. Optimised for iOS, the Glass companion app will be up for free in Apple's App Store by the end of the week. Besides MyGlass for iOS, the XE12 update, which is being rolled out for both the new Glass hardware as well as the older iteration, brings a lot of new features while doing away with a few. First up, there's no longer a need to say "OK, Glass, take a picture". 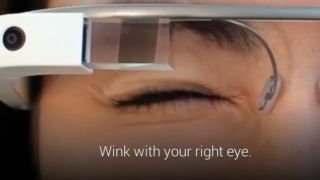 With what Google is calling an "exploratory" feature, you'll be able to snap pictures with just a wink - which may worry non-Glass owners and may make Glass owners look a little more creepier. On the other hand, your Glass will be a little safer with a screen lock, which activates when it powers down or you remove the Glass, though it isn't clear yet how you will be able to unlock the device. Google has also removed the "Guest Mode" feature, which will likely make sharing and showing off the device even more difficult. Speaking of features removed, XE12 will no longer attach a "Sent through Glass" tag to SMS messages, but there's no sign of being able to deactivate the signature on emails yet. Google Search cards, YouTube and Google Music Glassware functionality have all been beefed up as well, while Google has added a "Glass must cool down" warning for when the hardware starts to overheat. But in terms of all new Glassware apps, Hangouts is finally making its debut on XE12 as well. Haven't been able to get your hands on Glass yet? Here are some Google Glass competitors you can check out instead.